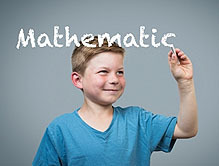 My child does not have a learning difficulty, but I would like to have his reading, learning and maths skills improved. Will the classes also be beneficial for him? What could one expect in terms of progress? I stay too far from a clinic to take my child to the classes. What can I do? A child's ability to read, learn and do maths effectively lays the foundation for their academic success, which has a far-reaching impact on their future. Edublox reading and learning clinics specialise in educational interventions comprising of brain training, reading, spelling, comprehension and maths. Since implementing our franchise model in 2010, Edublox has grown to include 26 offices, offering a variety of services and products. By using tried and tested educational practices based on established theories, and quality control at all franchises, we can guarantee a 95% success rate and long-standing results, which your child will benefit from for years to come. Providing challenging and fun learning experiences. Working professionally through proper business practices and fit-for-purpose computerised systems. 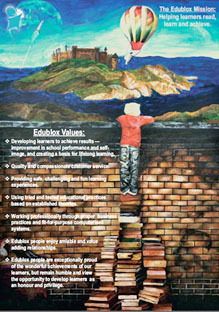 Edublox people enjoy amiable and value adding relationships. Edublox people are exceptionally proud of the wonderful achievements of our learners, but remain humble and view the opportunity to develop learners as an honour and privilege. Although there are several learning principles that are of importance, one fundamental principle is that human learning does not take place on a single level, but is a step-by-step process. This characteristic is globally accepted as an educational principle. The way in which the school system throughout the whole world is organised is an acknowledgement of this. One cannot send a child to university first. He must start in the first class and then progress year after year to the higher levels of education. Unless he has mastered a sufficient amount of the knowledge to form a firm enough base on which to build the knowledge of the following year, he will not make progress in the next class. Another simple and practical example is the fact that one has to learn to count before it becomes possible to learn to add and subtract. Suppose one tried to teach a child who had not yet learnt to count, to add and subtract. This would be quite impossible, hence no amount of effort would ever succeed in teaching the child to add and subtract. 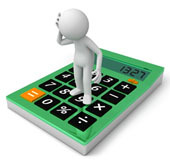 This shows that counting is a skill that must be mastered before it becomes possible to learn to do calculations. This means that there is a protocol that is to be observed in teaching. Certain things have to be taught first, before it becomes possible to teach other things. Visual, auditory, sequential, iconic, short-term, long-term and working memory. The ability to decode, integrate and classify information. By storing these foundational skills in the subconscious mind they become automatic. At the same time learners are given opportunities to apply these foundational skills in practice. The outcome is: improved reading, learning and mathematical ability, which leads to improved academic performance, simultaneously building the learner's self-image and improving his self-image. We thus create a basis for lifelong learning. Successful intervention is dependent on finding the cause or causes of a problem. The first step is therefore to establish the cause or causes of the learner's difficulties, which is determined through a one-hour assessment. After the assessment, the results are discussed with the parents and recommendations are made, based on the nature and degree of the problem. Usually one or two classes per week, combined with homework of a few minutes per day, is recommended. Each class is 90 minutes in duration. Contact us to schedule an assessment. Falling behind in class, sometimes even with special help or tutoring. Concentration: Focussed and sustained attention. Perceptual skills: Visual and auditory foreground-background differentiation; visual and auditory discrimination, synthesis and analysis; form discrimination; spatial relations. Memory: Visual, auditory, sequential, iconic, short-term, long-term and working memory. Logical thinking: Deductive and inductive reasoning. Reading, spelling, vocabulary and comprehension. An in-depth understanding of the terminology used in maths. Application in the form of curriculum-based exercises — mental arithmetic, reading time, word sums, et cetera. It is currently the world's most widely used language, with over 1.8 billion users world-wide. It is the language of business, science, technology, internet and sport. Any person's chance to be successful academically or in the workplace is enhanced tremendously if he or she is fluent in English. Vocabulary: Extensive word lists with researched descriptions. Reading and spelling: Powerful and fun exercises ensure fast and sustainable learning. Grammar: Rules are dealt with comprehensively and include tenses, nouns, degrees of comparison, etc. Pronunciation: Tutor-based learning ensures correct pronunciation. What needs to be memorised, understood and practised. Techniques to quickly understand content. How to plan and write essays and speeches. Is doing maths a complete nightmare? If you answered "yes" to any of the above, our intensive 1-on-1 course might be the answer for you! 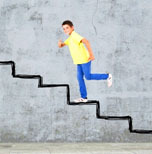 While there is no 'quick-fix' for learning failure and learning difficulties, our intensive 1-on-1 course has proved to accelerate results and will help your child take a giant leap forward! After the intensive course, the learner will ideally continue with the weekly Edublox or Mathblox classes or continue with one of the Edublox home programs. Has your child fallen behind academically? At risk of repeating a school year? Our specialised and personalised tutoring services for Grade 1 – 7 learners, aged 7 – 14, will help your child get back on track with their academic success, allowing them to return to mainstream school. We focus on over 200 hours of brain training per year, which is vital for correcting a child's cognitive skills. Hundred hours of reading, spelling and comprehension activities are provided, over and above tutoring academic subjects. We strive to develop each learner's self-image and self-esteem, helping them become independent learners. Our bridging program focuses on developing your child's cognitive skills and correcting their academic difficulties. For more details and information contact your local Edublox franchise office. Naturally. Just like an athletic child will benefit from judicious training and exercise, the intellectually talented child will benefit from cognitive training, and can develop into a "great mental athlete". After about fifteen to twenty hours you may notice improvement in some non-academic areas. It may be that the learner is able to organise their work better, is more attentive in class, or is able to express themselves more easily. At first you may not be sure whether this is the result of Edublox or not. After about thirty to forty hours you should see some significant improvements in the learner's academics. The learner might remember more of what was said in class, spend less time to complete homework, study less but maintain the same marks for tests and exams, or attain higher (sometimes much higher) marks for tests and exams. At this point one usually starts seeing an improvement in self-esteem. It must be noted, however, that improvement is seldom gradual. When improvement becomes noticeable, it is usually sudden. After this initial — and usually clearly visible — intellectual jump, it frequently happens that the learner finds himself on a plateau again, followed by another leap forward. This pattern can repeat itself many times. The above scenario could be described as a "staircase effect". However, one may occasionally also see a "snowball effect", meaning that the initial progress is slow but as the learner continues, their progress accelerates. The learner will surely reach plateaus. This is normal. Usually the learner will plateau for some time and then surge forward again. Try to limit breaks to the minimum. Long breaks can cause some of the momentum to be lost. It is important to continue with Edublox until the foundational skills have been thoroughly automatised. If one stops too soon there is the danger of a relapse. The minimum time that is required to achieve this is about 90 hours, but it can take up to 240 hours if the learner has severe learning problems. Note that these are guidelines only. Since every learner is different the speed of improvement will differ from learner to learner. Home programs that will address the learner's specific needs will be recommended after the assessment in cases where parents are unable to transport learners to the classes. You may also wish to consider our intensive 1-on1 course as well as our intensive holiday courses. Susan is an educational specialist and published author in the field of learning problems and dyslexia. With over 25 years of research to her name Susan conceptualised the Edublox tools and defined the teaching and learning methods that make the Edublox brand so successful. Susan obtained a BA Honours in Psychology from the University of Pretoria in 1986 and completed a BD in Theology from the same university a year later where she obtained a prize for the best thesis. Early in her professional career Susan was instrumental in training over 3000 teachers and tutors, providing them with the foundational and practical understanding to facilitate cognitive development amongst children who struggle to read and write. In 2007 Susan opened the first Edublox reading and learning clinic. There are now 25 Edublox clinics across Southern Africa. The Edublox tools Susan helped develop are now sold to parents in 40 countries around the world including the United States of America, Australia, England, Canada, Singapore, India and even Trinidad and Tobago. Susan has written and co-authored a number of books on the subject of learning including The Truth about Learning Disabilities (1993), The Right to Read: Beating Dyslexia and other Learning Disabilities (2000) and the Edubrain Reading Programme and Toolkit (2013). She has also written numerous articles on the subject of health, nutrition and wellbeing. 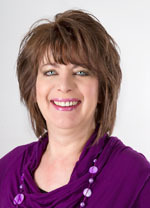 With 25 years of experience in helping children to successfully overcome learning difficulties, Susan has appeared on various television programmes including 3 Talk with Noeleen (SABC 3), Mother of all Professions (SABC 2), Ontbytsake (kykNET) and has been approached for comment in numerous print magazines. Susan has also spoken about cognitive development, brain training and learning problems at meetings of school principals and on radio talk shows, both locally and in Singapore. Susan is determined to give every child the best opportunity to realise their educational potential and believes that dyslexia and other learning disabilities can be overcome through the correct cognitive development and training. Her proudest moments are when she hears how a child who had severe learning difficulties is able to come top of their class after one or two years at Edublox. Susan always takes time to collect the 'hero' stories of Edublox learners whose self-esteem is lifted as their marks improve, some by 30%. Henk is the brains behind the business development of the Edublox brand, which under his guidance has opened 21 new clinics in five years. He is a registered Industrial Psychologist with a Master's degree in Commerce specialising in Human Resource Management (University of Pretoria, 1995). 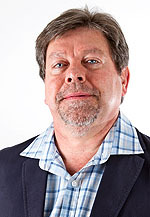 Early in his career Henk developed training interventions for organisational change at Eskom and has continued to specialise in training management at all levels; for individuals, teams and organisations. When consulting for Deloitte, Henk assisted large firms undergoing organisational change. As an action coach at the Gordon Institute of Business Science, Henk provided hands on practical training for young business professionals and facilitation by learning through project-based group work. In his capacity as Director of The Learning Theatre, Henk combined his training expertise with passion for dramatic art to introduce organisational changes through the theatre medium. Henk’s interactive drama presentations enabled dynamic learning of new behaviour and corporate messages for employees at 60 large organisations including Standard Bank, Engen, AngloAshanti, Ampath, Auditor General of South Africa and Sasol. Although Henk has been a share holder in the family business since 1988, he started to work full time as Managing Director of Edublox in 2009, driving business and staff development. As a key decision maker Henk is responsible for resource management and communication as well as inculcating the franchisee culture through financial review, supervision and monitoring of training. He leads the strategic expansion of the Edublox business and plans to more than double the number of franchises in Southern Africa and to establish an international master franchise in the Middle East in the next five years. With an extensive track record in training and business consulting, Henk's role at Edublox is an obvious fit as he continues to specialise in the learning and training arena. Henk describes Edublox using the analogy of a car. "The Edublox educational programme is the engine; I make sure the car drives well which means our children get the best educational support they deserve." Gustav started off his educational journey at the University of Pretoria as a BCom Informatics student, because information technology was a skill that he simply seemed to practise in his stride. Having had his own computer company since Matric and applying his knowledge as part-time sales consultant in this industry, Gustav was ready for a career in IT. However, having completed his first year, he realised that he wanted to specialise in marketing and management, and he enrolled at the IMM Graduate School of Marketing to further his studies. The road that led Gustav to Director of Franchise Operations started in 2010 when he was appointed IT Support Administrator at Edublox reading and learning clinic. In this capacity Gustav was responsible for IT administration which entailed desktop support, email setup, software setup and management, and the monitoring of servers and work stations across all the Edublox franchises. 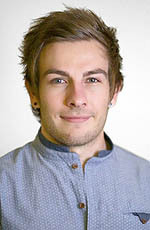 Gustav developed a keen interest in the business side of the company and whereas his initial involvement was to design and upgrade the business management Excel files, he soon came to manage the entire Edublox business system and SharePoint, liaising with the system developer and delegating support items to staff. During this period, he also became a franchise business consultant and facilitated monthly performance discussions with franchisees. As the number of franchisees grew, Gustav’s expertise developed to such an extent that was able to progressively take on more responsibilities. Over a period of three years he managed to change his title by his dedicated involvement in franchise operations and today he directs all franchise aspects namely site approval and selection, coaching, monitoring performance, facilitating communication and coordinating monthly franchisee forums, to name but a few, while still keeping his fingers on the development-pulse to ensure ongoing refinement and cutting edge operational processes.